This tutorial teaches you how to build an Outlook add-in that can be used in message compose mode to insert content into the body of a message. The add-in that you'll create in this tutorial will read gists from the user's GitHub account and add the selected gist to the body of a message. Complete the following steps to create two new gists that you can use to test the add-in you're going to build. In the Gist description... field, enter Hello World Markdown. In the Filename including extension... field, enter test.md. This is content converted from Markdown! Select the Create public gist button. In the Gist description... field, enter Hello World Html. In the Filename including extension... field, enter test.html. Use the Yeoman generator to create an Outlook add-in project. After you complete the wizard, the generator will create the project and install supporting Node components. Navigate to the root directory of the project. In the root directory of the project, create a new file named support.html and add the following markup. Open the manifest.xml file and update the SupportUrl element to point to the support.html file that you created. Locate the ProviderName element and replace the default value with your company name. Locate the Description element, replace the default value with a description of the add-in, and save the file. Before going any further, let's test the basic add-in that the generator created to confirm that the project is set up correctly. At the command prompt, make sure you're in the root directory of your project, and enter npm start. This will start a web server at https://localhost:3000. Open either Internet Explorer or Microsoft Edge and navigate to https://localhost:3000. If the page loads without any certificate errors, you can close the browser and proceed to step 4. If your browser indicates the site's certificate is not trusted, proceed to the next step. Office Add-ins should use HTTPS, not HTTP, even when you're developing. If your browser indicates the site's certificate is not trusted, you'll need to add the certificate as a trusted certificate. See Adding Self-Signed Certificates as Trusted Root Certificate for details. Chrome (web browser) may continue to indicate the the site's certificate is not trusted, even after you have completed the process described in Adding Self-Signed Certificates as Trusted Root Certificate. Therefore, you should use either Internet Explorer or Microsoft Edge to verify that the certificate is trusted. After your browser loads the add-in page without any certificate errors, follow the instructions in Sideload Outlook add-ins for testing to sideload the manifest.xml file that's located in the root directory of the project. In Outlook, open an existing message and select the Display all properties button. If everything's been set up correctly, the task pane will open and render the add-in's welcome page. Open the manifest.xml file and locate the ExtensionPoint element with type MessageReadCommandSurface. Delete this ExtensionPoint element (including its closing tag) to remove the buttons from the read message window. The ExtensionPoint with xsi:type="MessageComposeCommandSurface" indicates that you're defining buttons to add to the message compose window. By using an OfficeTab element with id="TabDefault", you're indicating you want to add the buttons to the default tab on the ribbon. The Group element defines the grouping for the new buttons, with a label set by the groupLabel resource. The first Control element contains an Action element with xsi:type="ShowTaskPane", so this button opens a task pane. The previous code references labels, tooltips, and URLs that you need to define before the manifest will be valid. Specify this information by making the following changes in the Resources section of the manifest. Within the collection of child elements under the bt:ShortStrings element, locate the child element with id="groupLabel". Change the DefaultValue attribute of this element to Git the gist. Add the following elements as children of the bt:ShortStrings element. Add the following elements as children of the bt:LongStrings element. Save your changes to the manifest. Since you previously installed the add-in from a file, you must reinstall it in order for the manifest changes to take effect. Follow the instructions in Sideload Outlook add-ins for testing to locate the Custom add-ins section at the bottom of the My add-ins dialog box. Select the ... button next to the Git the gist entry and then choose Remove. Close the My add-ins window. The custom button should disappear from the ribbon momentarily. Follow the instructions in Sideload Outlook add-ins for testing to reinstall the add-in using the updated manifest.xml file. After you've reinstalled the add-in, you can verify that it installed successfully by checking for the commands Insert gist and Insert default gist in the message compose window. Note that nothing will happen if you select either of these items, because you haven't yet finished building this add-in. If you're running this add-in in Outlook 2016 or later for Windows, you should see two new buttons in the ribbon of the message compose window: Insert gist and Insert default gist. If you're running this add-in in Outlook on the web, you should see a new button at the bottom of the message compose window. Select that button to see the options Insert gist and Insert default gist. This add-in needs to be able to read gists from the user's GitHub account and identify which one the user has chosen as the default gist. 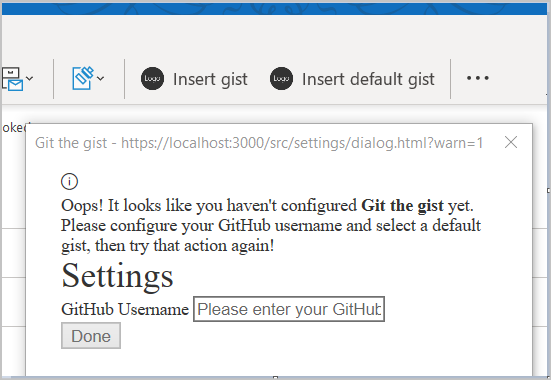 In order to achieve these goals, the add-in must prompt the user to provide their GitHub username and choose a default gist from their collection of existing gists. Complete the steps in this section to implement a first-run experience that will display a dialog to collect this information from the user. Oops! It looks like you haven't configured <strong>Git the gist</strong> yet. Please configure your GitHub username and select a default gist, then try that action again! Next, create a file in the settings folder named dialog.css, and add the following code to specify the styles that are used by dialog.html. Now that you've defined the dialog UI, you can write the code that makes it actually do something. Create a file in the settings folder named dialog.js and add the following code. Note that this code uses jQuery to register events and uses the messageParent function to send the user's choices back to the caller. The dialog.js file you just created specifies that the add-in should load gists when the change event fires for the GitHub username field. To retrieve the user's gists from GitHub, you'll use the GitHub Gists API. Create a folder in the root of the project named helpers. In that folder, create a file named gist-api.js, and add the following code to retrieve the user's gists from GitHub and build the list of gists. You may have noticed that there's no button to invoke the settings dialog. Instead, the add-in will check whether it has been configured when the user selects either the Insert default gist button or the Insert gist button. If the add-in has not yet been configured, the settings dialog will prompt the user to configure before proceeding. If the add-in has already been configured, the function will load the content of the gist that the user has selected as the default and insert it into the body of the message. If the add-in hasn't yet been configured, then the settings dialog will prompt the user to provide the required information. A function that's invoked by a UI-less button must be defined in the file that's specified by the FunctionFile element in the manifest for the corresponding form factor. This add-in's manifest specifies https://localhost:3000/function-file/function-file.html as the function file. Open the file ./function-file/function-file.html and replace the entire contents with the following markup. Open the file ./function-file/function-file.js and replace the entire contents with the following code. Note that if the insertDefaultGist function determines the add-in has not yet been configured, it adds the ?warn=1 parameter to the dialog URL. Doing so makes the settings dialog render the message bar that's defined in ./settings/dialog.html, to tell the user why they're seeing the dialog. // warn=1 to display warning. The HTML function file references a file named addin-config.js, which doesn't yet exist. Create a file named addin-config.js in the helpers folder and add the following code. This code uses the RoamingSettings object to get and set configuration values. If the gist contains HTML, the add-in will insert the HTML as-is into the body of the message. If the gist contains Markdown, the add-in will use the Showdown library to convert the Markdown to HTML, and will then insert the resulting HTML into the body of the message. If the gist contains anything other than HTML or Markdown, the add-in will insert it into the body of the message as a code snippet. Save all of your changes and run npm start from the command prompt, if the server isn't already running. Then complete the following steps to test the Insert default gist button. Open Outlook and compose a new message. In the compose message window, select the Insert default gist button. You should be prompted to configure the add-in. In the settings dialog, enter your GitHub username and then either Tab or click elsewhere in the dialog to invoke the change event, which should load your list of gists. Select a gist to be the default, and select Done. Select the Insert default gist button again. This time, you should see the contents of the gist inserted into the body of the email. This add-in's Insert gist button will open a task pane and display the user's gists. The user can then select one of the gists to insert into the body of the message. If the user has not yet configured the add-in, they will be prompted to do so. Create a folder in the root of the project named msg-compose. Then in that folder, create a file named insert-gist.html, and add the following markup to define the UI for the task pane. Create a file in the msg-compose folder named insert-gist.css, and add the following code to define the styles used by the task pane. Create a file in the msg-compose folder named insert-gist.js, and add the following code to specify the script for the task pane. // and insert into the body. Save all of your changes and run npm start from the command prompt, if the server isn't already running. Then complete the following steps to test the Insert gist button. In the compose message window, select the Insert gist button. You should see a task pane open to the right of the compose form. 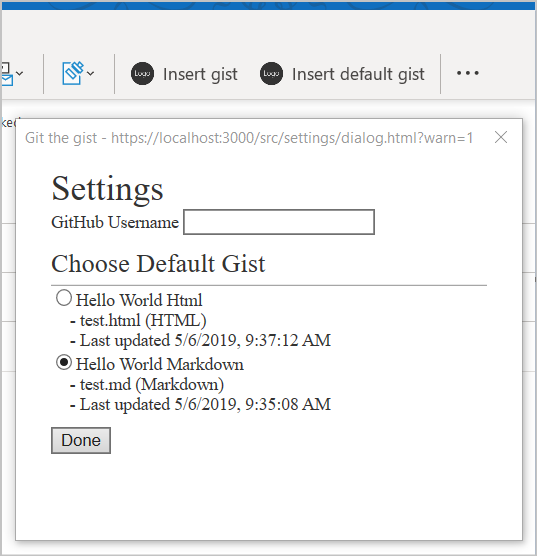 In the task pane, select the Hello World Html gist and select Insert to insert that gist into the body of the message.